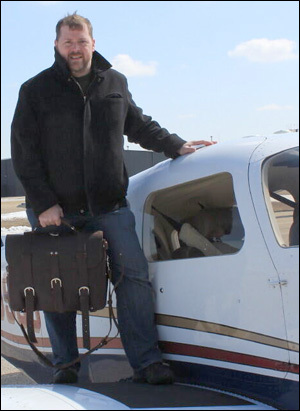 Paul Lemley, a fellow pilot, was dissatisfied with the quality of flight bags available on the market. At first he settled for what was available. Then finally decided he would solve the problem and build his vision of the perfect flight bag. In homage to the Pan Am era of aviation where aviation was a luxury and passengers and pilots were well-dressed he has created the Classic Flight Bag. The hand stitched bag is made with genuine Crazy Horse leather and has a very sturdy feel. The inside is cotton fabric lined and has what I would deem an appropriate amount of pockets. I admit to having used a wide variety of bags in my nine years as a pilot, never being fully satisfied I had the right bag. I went from one extreme a duffel bag sized flight bag that could carry anything and everything I might need in the cockpit down to cramming all my needs into a headset bag. With technology taking over I think most people can fit there equipment into something between those two extremes. Sounds like a reasonable tradeoff for someone like me who flies for recreation and is not in an out of the bag all day long seven days a week. The bag worked for my purposes and surely looked nicer than my previous bag. Sadly, I don’t think I fly frequently enough to justify using this bag solely for flying. Instead I think I might use this bag for commuting to work knowing that each time I look at it I will evoke a feeling of that Pan Am era of travel and flying. The Classic Flight Bag is available online and retails at $495 but is currently on sale for $395 and ships for free.